The City of Branson (population 6,552; more than 7 million visitors annually and growing) is located in southwest Missouri, 35 miles south of Springfield within the heart of the Ozark Mountains. Branson serves as the job, service and shopping center for a two county area with 50,000 year round residents. 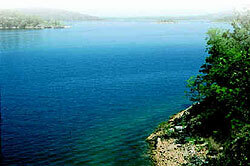 Branson is surrounded by three prize winning fishing lakes. The city has an incorporated boundary of over 17 square miles. This city has become the focus of international attention as both a major development area and an entertainment and tourism Mecca. The reasons are numerous and range from the scenic natural beauty of the area to the star studded theaters along Highway 76 with their line-up of major recording artists as well as other family oriented entertainment offerings. As a real estate professional, Kelly has made it his duty to know everything he can about relocating to, from or within Branson. Indeed, he’s widely considered an expert on the subject. Those who have worked with Kelly appreciate knowing the purchase of their new home is in the hands of such a capable and trustworthy professional while they’re wrapping up all the last-minute details of packing and moving out of their previous home. Kelly believes in making the real estate and relocation process as easy as possible for everyone involved. To him that means providing information to anyone who wants to find out more about the area he loves so much and knows so well.